Prints of the original Scottish Contemporary landscape painting by artist Andy Peutherer. Eilean Donan Castle on The West Highland coastal Sea Lochs of Scotland. An original abstract, atmospheric seascape / landscape painting of Eilean Donan Castle in Winter at Dusk. A dramatic mix of mediums are blended layered and splattered over the canvas to produce a very atmospheric painting depicting the ever changing wild weather that constantly sweeps across Scotland’s western sea lochs. Different types of paint and application of medium, create a unique style of atmospheric painting full of vibrant colour and Scottish drama. Painting & prints of Eilean Donan Castle, West Highlands, Scotland by Scottish landscape painter Andy Peutherer. 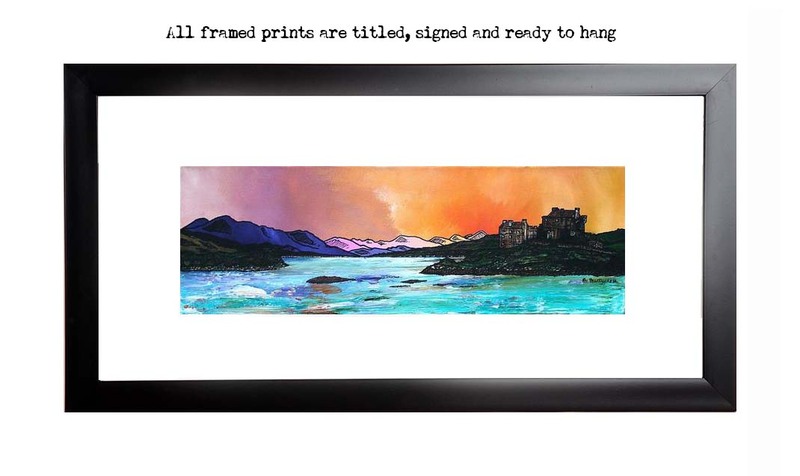 Framed prints of Eilean Donan Castle, West Highlands, Scotland by Scottish landscape painter Andy Peutherer. Scottish Highlands Paintings & Prints - Eilean Donan Castle Winter Dusk, West Highlands, Scotland.